Each successive railway timetable is extensively consulted for just a few months and is then thrown away. Yet, over a period of time, those timetables can provide a valuable insight into the way in which the railway passenger services have developed to meet competition from other modes of transport, to meet changes in travelling patterns and to satisfy public expectations. The writer has recently completed, with the aid of past timetables, a study of the changes which have occurred over the years to the public passenger service in North Staffordshire. Stoke-on-Trent was the headquarters and principal station of the North Staffordshire Railway Company throughout that company’s 75 years of independent existence and the station has continued to serve that city and its surrounding area through successive eras to the present day. It is the timetabled passenger service from Stoke-on-Trent which is the subject of this paper. Particular reference has been made to those timetables that illustrate landmarks in the history of the service. Firstly, the timetable for April 1910, which contains the service at the hey-day of the “Knotty” operation just prior to the federation of six towns to form the County Borough and later City of Stoke-on-Trent. Secondly, the timetable of the L.M.S. for October 1947, which contains the service in the aftermath of the war and immediately prior to nationalisation. Next (3), the B.R. timetables for May 1961, in use at the time of Dr Beeching’s controversial appointment as chairman of the British Railways Board. Later (4), the comprehensive B.R. timetable for May 1976, which marked the transition from geographically based regional services to route based InterCity and provincial services. Then (5), the winter timetable of November 1996, in operation in the last months of British Rail, just prior to privatisation, and finally (6), following privatisation, the timetable operated locally in June 1998, under the joint management of Railtrack plc and three operating companies, Virgin Trains, Central Trains and North Western Trains. 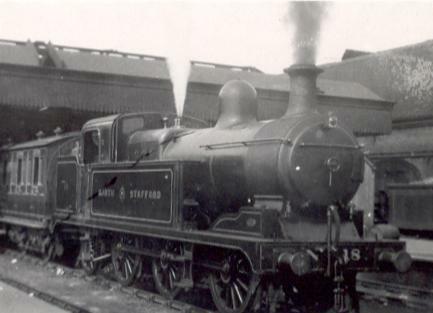 North Staffordshire Railway train at Crewe station in pre-LMS days. Before proceeding to the specific consideration of the individual services radiating from Stoke-on-Trent, some general observations and comparisons can be made. It is most noticeable that despite the intervention of two world wars and absorption into the L.M.S., the 1947 train services on the five main lines and most of the surviving secondary lines in North Staffordshire were remarkably similar to the N.S.R. services of 1910. This was true of the speed, frequency, timing and final destination of the train services. It was true of express services and of stopping trains and for connections as well as for through services. Indeed, in the matter of speed, the 1947 services were slightly slower than the 1910 services. In fact, almost the only significant changes were the decline of the loop-line services and the abandonment of many branch lines. The overall impression given is that the 1947 timetable was indeed the 1910 timetable which had grown old just as the railway system itself had grown old. Old and gnarled, slower and generally run down, lacking any sort of coherent plan, just occasional patches and some minor surgery. Not that North Staffordshire was an exception, this relative stagnation occurred throughout the country. Only on the Southern Railway – largely because of major electrification schemes – were there significant changes during that time. Ten more years were to follow, under nationalisation, before any major improvement came. Under British Rail, from about 1960 onwards, the timetables were redesigned and recast on a regular basis. This was part of the ongoing process by which a thoroughly modern railway, as indeed it had become, sought to respond to trends in passenger traffic and set out to encourage greater use of trains for long distance and cross-country journeys. In post war Britain, largely because of the private car, many people have become much more mobile and happily travel great distances each year for both business and pleasure. British Rail made great efforts, which met with notable success, to increase wherever possible, its share of this growing inter‑city traffic, in competition with the private car and other modes of transport. Much careful research led to the development of new passenger traffic flows and this is reflected in the later timetables. Two traffic trends are, however, discernible in all the timetables, when compared to those previously produced, even in the case of the 1947 timetable. The first is an increase in the number of express and longer distance services (often with an earlier first train of the day) and the second is a decline in local and stopping services. These trends are illustrated in Table A above and it will be noticed that although the number of trains daily in 1910 was almost twice the 1947 total, the 1947 train mileage was actually higher than the mileage in 1910. Furthermore, since 1947, the passenger train mileage has more than tripled. Examination of timetables also reveals that in 1996 there were approximately 110 stations and halts served daily by one or more through trains from Stoke-on-Trent. In 1910 the number so served was in the order of 120. However, in 1910 these included some 80 stations on the North Staffordshire Railway system (not counting the 18 on the Ashbourne, Churnet Valley and Burton-on-Trent branches), whereas by 1996 there were just 14 North Staffordshire Railway stations still open for passenger traffic. What North Staffordshire has lost in local services, however, would appear to have been restored threefold in through services over a much wider area. Summarised in Table B are counts of the number of services to each of the five principal destinations outside Staffordshire to which trains from Stoke-on-Trent have traditionally operated showing the average speeds of all through services as well as the fastest. Local services and trains terminating at Stafford are shown separately. Connecting services at Stafford are not shown. Local services throughout North Staffordshire have declined significantly over the years as is shown by the figures in Table C. The reasons for decline are clear. By 1910, the ‘Knotty’ (in intense competition with the P.E.T. tramway network) was providing the ‘six towns’ with an excellent and enlightened service of two loop line trains per hour throughout most of the day (44 trains daily each way). Newcastle-under-Lyme had 33 trains daily to and from Stoke-on-Trent. Yet, even this could not match the competition. Elsewhere in 1910, the local service was poor. Less than half of all the North Staffordshire Railway stations had more than six trains daily in each direction. The Biddulph line had just two trains daily, Audley and Sandbach lines each had three, Market Drayton had five, Cheadle had only six, and Leek fared little better with just eight trains. Uttoxeter and Pitts Hill each had ten trains daily to and from Stoke-on-Trent. Hanley had become, by 1910, the largest of the six towns and was already the commercial centre for the whole area and destined to remain so. But, apart from the loop line link with the other five town centres where only a fraction of Hanley’s workforce lived, Hanley lacked a local railway service. Indeed, following the post war suburban house building boom of the 1950s only a very small percentage of the population lived anywhere near a railway and travel to work by train was impossible for all but a small minority. North of Tunstall, the now closed loop line served relatively small communities. To the east, two former passenger lines from Biddulph and Leek converge at Milton which is under three miles from Burslem or Hanley by road, compared with over seven miles by railway and always with a change of train at Stoke-on-Trent. Yet it is to Hanley or even Burslem rather than Fenton or Stoke-on-Trent that most passengers and especially commuters from the north-east of the city have always needed to travel. Anyone wishing to travel the 4½ miles from Biddulph to Tunstall by train (not possible after 1927) would have had a choice of two trains daily and a journey of 14¾ miles that took over an hour with, of course, a change at Stoke-on-Trent. Beyond the city boundary to the west, the districts of Audley, Lycett, Silverdale and Newcastle were also served by a railway that went round in a circle before taking its passengers to Stoke-on-Trent rather than to Hanley. Then of course on finally reaching Hanley, after changing at Stoke-on-Trent, the traveller realised that the station was but the starting point for a long uphill walk to just about everywhere in town. Links are given below to five of the 15 Summary Tables that form part of the complete study but could not be included with the printed synopsis. Yet they are very useful in enabling a fuller insight into the services discussed. Click this Link to go to the index of all 15 summary timetables. The decline of the local services has over the years been eclipsed by the continuing development of InterCity and provincial services. Under nationalisation, the London service was improved beyond measure. In 1947, as in 1910, there were just three daytime trains to London (plus several connections at Stafford). By 1996 there were 15 through trains daily. Stoke-on-Trent certainly benefits today from being on the shortest rail route from Manchester to London. However, there was, in the early and mid sixties, a long period when most Manchester to London trains ran via Crewe or (at the height of the electrification work) via Matlock and Derby; and many journeys from Stoke-on-Trent involved a change at Stafford, Crewe or Derby. The May, 1961 timetable, for example, contained both through trains and connections which operated via Derby in order to reduce the number of trains on the West Coast main line during the preparation work for electrification. During those years the Stoke-on-Trent to London service fluctuated widely and at one stage almost ceased to exist. Manchester to London Euston services returned to the Stoke-on-Trent route on completion of the electrification work in 1967, but at first as a two-hourly interval semi-fast service only and the future was by no means secure. The number of through services has varied from year to year. By 1976 there were eleven, but as recently as 1988 this had reduced to eight through trains during the day plus one overnight. By 1996, with fifteen Manchester to London trains daily via Stoke-on-Trent compared with just two via Crewe, the future was looking rosy. Good services to London are vital to the prosperity of any British city and the service from Stoke-on-Trent is now truly excellent. It is primarily a Manchester to London service, which could, if necessary, run entirely via Crewe. The people of North Staffordshire should never take it for granted. The improvement in service on this line is even more remarkable. There were 17 through trains to Birmingham and four good connections daily in 1996 compared with six through trains and six connections in 1947. Speeds are not high but the average journey time from Stoke-on-Trent to Birmingham has been halved, which is a truly remarkable achievement for this very busy route. Two intermediate stations have closed between Stoke-on-Trent and Stafford but four remain. In 1947 the earliest possible arrival in Birmingham was 09:16 on the 07:32 from Stoke-on-Trent. By 1996 there were five fast trains arriving in Birmingham at 7:54, 8:16, 9:00, 9:33 and 9:54 after journeys of about an hour; and an excellent service throughout the day. Significant also is the growth of through services to destinations beyond Birmingham. In 1947 there were none. In 1976 there was one to Plymouth, a second to Taunton, one to Coventry and one to Cardiff making a total of four. By 1996 there was one West Country InterCity express to Cheltenham Spa, Bristol, Taunton, Exeter, and Plymouth and seven through trains ran to Birmingham International and Coventry. Of these, six provided an excellent service to Leamington, Banbury, Oxford and Reading before continuing to southern destinations including Gatwick Airport, Brighton, Basingstoke, Winchester, Southampton, Bournemouth and Poole. This line has certainly seen many changes in its passenger services since the war. In 1947 there were only eight through trains to Derby of which seven provided a connection at Tutbury for Burton-on-Trent. With the withdrawal of the loop line services came station closures leaving just three stations between Stoke-on-Trent and Derby. Tutbury station re-opened in 1989. That the Derby service has survived and almost doubled from eight to fifteen trains per day is a tribute to British Rail. Since 1947, speeds on this line have increased significantly, Stoke-on-Trent to Derby is now on average 52% faster than 1947. In ‘Knotty’ and L.M.S. times, trains rarely strayed beyond Derby except for Summer excursions returning from Llandudno to Nottingham or Leicester. By 1976 most trains on this line were running through to Nottingham and Lincoln. Recently, the reorganisation of the South Lincolnshire services from Nottingham through Grantham to Skegness has enabled the through running of ten trains daily from Crewe and Stoke-on-Trent to Boston and Skegness making possible excursions which would have been very difficult just a few years ago. Examination of the 1910 and 1947 timetables shows how few public passenger trains actually ran on this line compared to the numbers later operated by British Rail. In 1947 there were just five expresses and nine very slow stopping trains to Manchester plus three more even slower stopping trains to Manchester which ran via the loop line. These plus a further 13 local trains made a total 14 main line and 16 loop line trains per day in 1947. By 1976 the electrified service was offering 18 expresses and 19 stopping trains daily between Stoke-on-Trent and Manchester Piccadilly. The service in 1996 was very similar to 1976 except that there were nine fewer stopping services but nine more expresses, including one through train to Edinburgh. In 1947, the first express for Manchester left Stoke-on-Trent at 11:41, took 1 hour 24 minutes and arrived at 13:05. For the commuter or day visitor this was quite useless. Such a passenger would need to catch the local at 07:00 due in Manchester at 08:34 or else the 08:06 that arrived at 09:40. By 1996, the 07:45 express was arriving in Manchester at 08:32 and the even faster 08:51 express at 09:34 and there were three stopping trains as well. Similar considerations appled to the return in the afternoon or evening. Of all the North Staffordshire passenger services, that to Crewe has changed least. Two intermediate stations have closed but four remain. The 13 trains in 1947 had increased to 17 by 1979 only to reduce to 15 by 1996 with the average journey time of 34 minutes falling to 27 minutes. The speed has thereby risen by a very modest 25% and it is not clear why this half of the through service should be significantly slower than that from Stoke-on-Trent to Derby. In an interesting post-nationalisation development, the Crewe trains now  run through to Manchester Airport giving an hourly service from Stoke-on-Trent [Airport service discontinued 2003]. The foregoing account is but a brief introduction to the study of railway timetables, in which the writer seeks to raise awareness of the value of timetables as evidence of the passenger service provided by the North Staffordshire Railway and its L.M.S successor and of the very great changes which have taken place during the 48 years of nationalisation. © Noel R Walley, 1998 & 2003. 1. Bradshaw’s April 1910 Railway Guide [New Edition] (Newton Abbot: David and Charles, 1968), 530-537. 2. L.M.S. Passenger Services, October 6th, 1947 until further notice (Manchester: Henry Blacklock & Co. Ltd., 1947), 141-148. 3. Bradshaw’s British Railways Guide, From 1st May until 11th June, 1961 (London: Henry Blacklock & Co. Ltd., 1961), 634-638. 4. Great Britain Passenger Timetable, 3rd May 1976 to 1st May 1977 (London: British Railways Board, 1976), 484-95 & 512-15. 5. Great Britain Passenger Railway Timetable, 27th September 1996 to 25th May 1997 (London: Railtrack plc, 1996). 6. Great Britain Passenger Railway Timetable, 24th May 1998 to 26th September 1998 (London: Railtrack plc, 1998). The above synopsis was published in the Autumn 1999 edition (volume 30) of ‘Staffordshire History’ and also in Journal No. 12 (April 2003) of the North Staffordshire Railway Study Group. The NSRSG was formed in October 1995 to bring together people with an interest in the North Staffordshire Railway, in order to increase the knowledge of the railway, and to improve the understanding of the role of the railway within the community it served. Click on the name above to visit the Study Group website.